President Park Geun-hye will not comply with the prosecution’s call for a face-to-face questioning, her lawyer confirmed Monday, reiterating her earlier stance that she would rather face an incoming independent counsel probe. While the prosecution made a last-minute attempt to connect the president to the extensive allegations involving her confidante Choi Soon-sil, political parties shifted their focus to constituting an independent counsel which will substitute the thwarted prosecutorial investigation. “The president cannot cooperate with a face-to-face questioning on Nov. 29,” said Park’s legal representative Yoo Yeong-ha in a statement. This refusal came just a day ahead of the prosecutors’ deadline. “As you all know, the president has a number of urgent agendas, including the appointment of an independent counsel (within the week),” he added. 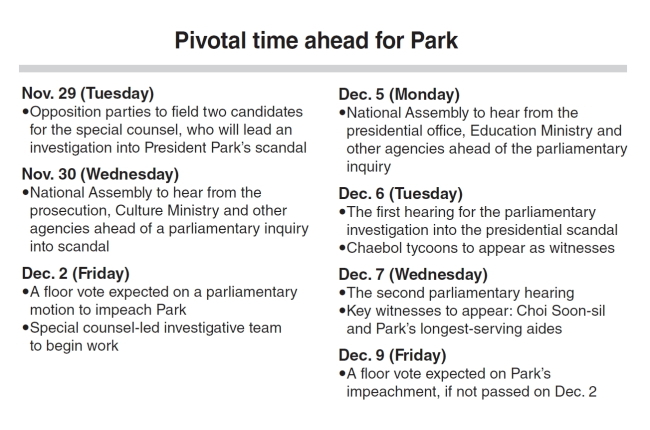 But the prosecution zeroing in on the bribery allegations involving the president, as well as the resignation of key legal officials, is seen as posing an increasing challenge on Park’s political status. “President Park has accepted the resignation of the justice minister and held off that of the senior presidential secretary for civil affairs,” Blue House Spokesperson Jung Youn-kuk told reporters in a text message. 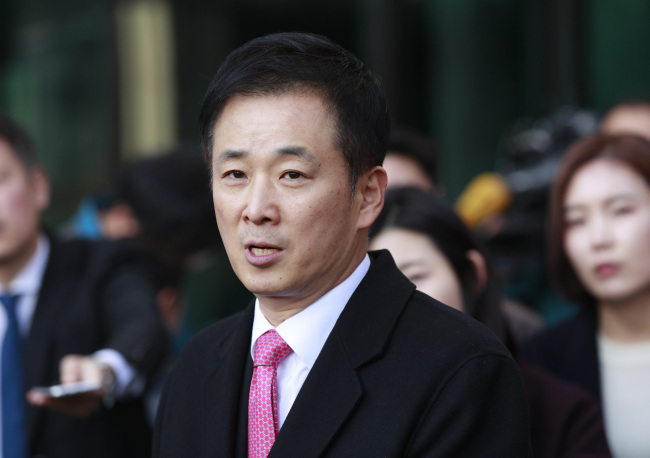 The two top officials, Justice Minister Kim Hyun-woong and presidential adviser Choi Jai-kyeong, submitted their resignation early last week, following the prosecution’s decision to include Park as an accomplice in the criminal allegations involving her friend Choi. Though both claimed “responsibility over the situation,” their offer to step down was largely taken as a sign of division between the presidential house and the government over the persisting state scandal. Kim was the chief supervisor for the prosecutorial organization and Choi the chief official for the president’s legal affairs. The two were even rumored to have received pressure to deter the prosecution’s aggressive probe. “The president’s stance on the independent counsel remains unchanged,” the spokesman said. On Thursday, the president approved a bill to launch an independent counsel investigation on herself and her friend Choi, and officially requested that the opposition political parties recommend two candidates to lead this incoming probe unit. Once the president chooses between the two, a special investigation is to kick off and substitute the current prosecutorial probe. “Once the independent counsel chief is picked, it is likely that the prosecution’s special probe team may be dismissed right away, handing over the related documents and dispatching some of its key investigators to the incoming team,” said a prosecution official. The main opposition Democratic Party of Korea and the runner-up People’s Party agreed earlier to submit their candidate resignation as late as possible -- Tuesday -- so as to buy some time for the ongoing probe. With no signs of cooperation from the Blue House, the opposition parties are set to make their final selection for the candidates, but they are said to be facing obstacles, due to the refusals of the candidates. A number of former senior prosecutors, especially those from the progressive-leaning Honam region in the southwest of the nation, have so far been tapped as plausible figures for the job but most have turned down the offers. “(People) do not mind being named as minister candidates, but when it comes to an independent counsel, most do not wish to have their names mentioned,” Democratic Party floor leader Rep. Woo Sang-ho told reporters.